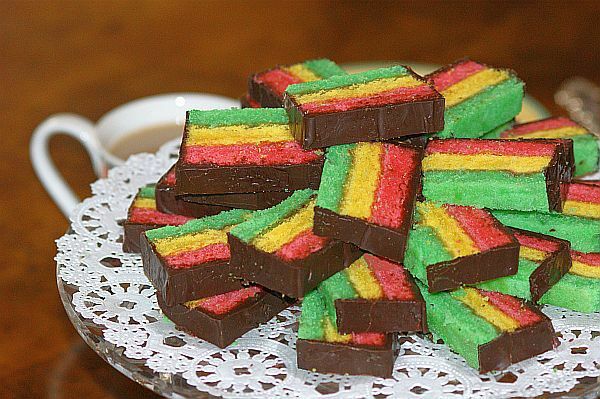 Rainbow cookies are a staple at Jewish bakeries. The question is, why, since they are an Italian confection, representing the colors of the Italian flag (where the yellow portion represents the white in the flag). Author Stanley Ginsberg speculates it's because of the close proximity of Jewish and Italian immigrants, virtually from the beginnings of their American experience. "They shared steerage on the voyage to America and lived in the same neighborhoods. Their children went to the same public schools, and their respective bakeries were rarely more than a block or two away. How could the food cultures not have cross-fertilized?" Ginsberg says. This recipe takes a little time to prepare because the "cookies," which are more like a sponge cake, consist of three layers sandwiched together with jam and topped with chocolate icing. The layers must set up in the refrigerator for 24 hours before icing, so plan accordingly. The extra labor is worth it, especially if you want to dazzle the kids or any guests for that matter. Place rack in the middle of the oven and heat to 400 F / 204 C. In a large bowl or stand mixer, mash the almond paste using a fork. Using the whisk attachment at medium speed (6 n a KitchenAid), bend the almond paste and 1/4 of the beaten eggs until smooth and lump-free, 3 to 4 minutes. Add the shortening, butter, salt and remaining eggs, and beat until soft and light in color, 7 to 8 minutes. Add the flour 1/2 cup at a time, followed by the vanilla. Continue creaming until the batter is evenly mixed, with a very light texture. Divide the batter into 3 equal portions of about 10 ounces/284g each, and put each into a separate bowl. Add a different food coloring to each and whisk until thoroughly blended. Melt the jam in the top of a double boiler or on very low heat to avoid burning. Brush as thin as layer of jam as possible on top of the green layer and immediately put the yellow layer on top. Repeeat for the red layer, so that you end up with a multicolored block, with the jam as the glue. Wrap the block in plastic and return into one of the clean and dry baking pans. Place a second pan on top of the layers, add a 2 to 3-pound/1.5 to 2kg weight and refrigerate for 24 hours. In a small saucepan, heat the water and corn syrup to boiling, then stir in the confectioners' sugar, cocoa powder and fanilla until well bolended and lump-free. Remove from heat and let cool. The icing will be at optimal spreading temperature when it feels neigher hot nor cool on your lips. Remove the cookie block from the refrigerator and cut into 4 (8x2x2-inch/20x5x5cm) bricks. Using a metal spatula, apply a thin coating of icing to the top and long sides of each brick in a single, smooth stroke, if possible. Let cool unil the icing has almost hardened and use a sharp knife to cut the bricks crosswise into 1/2-inch/1.25cm slices. These freeze very well.